Compounder/ Dresser and Non Combatant Employees. Application forms for the above vacancies available from 15th January-2018. Total vacancies has been released by the Civil Defence & Home Guards Department are 229 posts. Duly filled applications along with self attested copies of supportive documents must have submitted before 15-02-2018. Application fee for this Meghalaya civil Defence Recruitment is Rs. 50/-. Candidates will be selected for Sub Inspector, Guardsman and other vacancies in Meghalaya Civil Defence Recruitment is based on Physical Efficiency Test, Written exam and Interview. 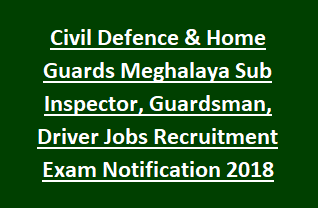 Other details of Civil Defence & Home Guards Meghalaya Recruitment 229 Sub Inspector, Guardsman, Driver Jobs are given below. Total available vacancies in Meghalaya Civil Defence & Home Guards Recruitment are 229 posts. 1. Sub Inspector: 20 posts. 3. Compounder/ Dresser: 01 post. 6. Non Combatant Employees: 17 posts. Age limit for Sub Inspector, Draftsman, Compounder/ Dresser Jobs is 20 to 27 years. Age limit for Guardsman, Driver, Non Combatant Employees is 18 to 27 years. Driver: 10th pass with valid HMV/ LMV driving license. For other posts pay scale details see the notification. Candidates interested for Civil Defence Meghalaya Recruitment SI, Guardsman Jobs have to attend Physical efficiency Test, followed by written test and Interview. There will be no Physical Efficiency test and written test. Candidates who are domiciles of Meghalaya are required to submit the application forms in prescribed printed form through post or by hand from 15-01-2018 to 15-02-2018. Address details are mentioned in the notification.